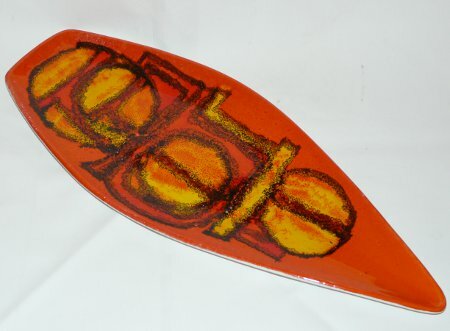 A bright Poole Pottery Delphis range spear dish shape number 82 decorated by the very collectable Poole decorator Carol Cutler. This Poole Delphis dish measures approximately 43cm long and 18cm wide at its widest point. It has been decorated in a bright orange base with the abstract pattern picked out in bright yellows. On its base it has the POOLE ENGLAND dolphin pottery mark which was in use by the Poole Pottery from c1966 until c1980, the stamped shape number 82, and the Poole pottery decorators mark CC for Carol Cutler. Carol Cutler used this mark from 1969 until 1975 - hence the dish can be dated to c1969-1975. Condition: Excellent overall condition with only light overall crazing. A stunning Delphis dish by a very collectable decorator.